This blog is my expression to the world on living frugal, sustainably green lifestyles. Waterless, Snow Globes! How Cute! Looks simple too! Thanks to Sweet Tea and Moonshine via Tea Paparazzo. New information can be found on the Food, Tools & Implements and Architecture pages. Hope everyone’s day has gone well and continues to do so. Um yeah! My thermometer on the front porch reads <30° which is cold for Swampfox country. The clouds have rolled away as the sun dances slowly higher amongst the bordering pines. Frost wisps away in curling fingers reaching skyward, twisting intricately. Keeping efficiency in mind, this is the season to do early morning walks around the home taking note of what surfaces have frost layered on them. Where you see this is actually a good sign! The surfaces without frost are energy (heat) leaks, these require attention and insulation. In doing so the cost of both heating and cooling a structure can be trimmed as much as possible. Here is a link that has pictures which show the value of insulating your roof. Information on system design added to Individual Power Production, safety concerns and wiring information. Soothing melody by Bhi Bhiman that embodies a simple life. These pages have new additions. Separate: Imagine having the ability to invest in community-owned power transmission lines. Shall it be considered merely a flight of fancy, when the heart is felt beating against the chest while crowding the throat, the mind insisting to rule the heart only to find it’s self caste aside and afloat… such are the musings of one in love, realizing they are servants of both the earth and the land above; no other experience in life gives the heat of a razor’s cut and that which is the smile, touch, kiss, embrace of one which you find you cannot do without. 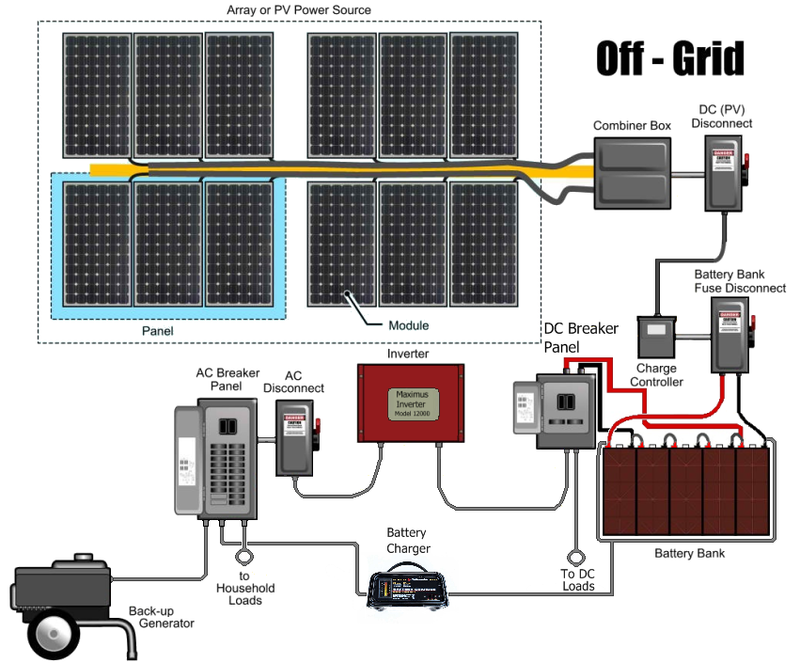 Today was spent going over thoughts of Off-grid setups for home power generation. To date I have made note of eight separate configurations to which one may accomplish this. I would like to give everyone a look at the base configuration to which I hope to have in place myself. There are some items note yet added to this diagram schematic such as showing the connections to alternate generating devices such as hydro and wind. Once completed, you can look for the completed diagram with additional information on the Individual Power Production page.